Land's End 2 BR/2 BA!!! NOW AVAILABLE for MONTHLY RENT! Luxury at the Lake!!! PLEASE CALL US FOR AVAILABILITY & PRICE. If you want to watch lake action, there is no better place to stay. We are located at the intersection of the Glaize arm and the main channel with a Spectacular View!!! This two bedroom, two bath, 1200 square foot condo has top quality furnishings from the bedding, linens and furniture to the kitchen appliances, dishes, and silverware. This new resort has elevators, a lighted boardwalk for the full mile of waterfront and an elegant 5000 square foot clubhouse with a fitness center inside. You can be one of the first to stay! One of the three pools located on site is within 20 feet of the lake. One side borders the 'no-wake' zone at the Grand Glaize Bridge, so it is perfect for watching million dollar cruisers slowly showing off!!! Simply put, it is an unparalleled view from the pool. The upper recreation area features a lazy river (with a good current so bring a cheap inner tube! ), a small toddler water park and a basketball court. The perfect family complex!! This complex also has quiet hours from 11pm to 7am to guarantee a quiet night. This condo is decorated just for your liking, everything is brand new and in pristine condition for your enjoyment. It has all the comforts of home... Only you are on vacation!!! Sit out on the screened in porch and watch the boats come and go, or relax in fashion in the 'great room' by enjoying the panoramic view while letting the sounds of the water hitting the shore lull you into your nap! Wake up in the afternoon and fire up the gas grill. This condo is perfect for a weekend getaway or a nice long stay with a king size bed in the master and a queen in the second. We also have a sofa sleeper for a larger group. We have Flat Screen TV's in both bedrooms and a 42' in the 'great room' plus a DVD/VCR unit in the living area as well. If you visit us when it is cool we have a gas fireplace to keep you cozy. Shopping at the mall with 110 outlet stores is only a couple minutes away. Along the way you will notice Highway 54 sprinkled with specialty shops and unique sights. You can golf for two weeks straight and never golf the same course if you want. We have tried to think of everything that will make your stay as pleasant as possible. If you have a boat, our 12 x 32 slip is also available with your stay. We have stayed at this condo several times over the past few years, and we have a great experience every time. Very clean, and comfortable. It also has a walk out patio, with easy access to the pool and boat docks. Would highly recommend for a great stay at the lake. We had a great time at the condo. Very clean and spacious. The area around the condo is awesome with lots to do for the kids. Would stay here again for sure. 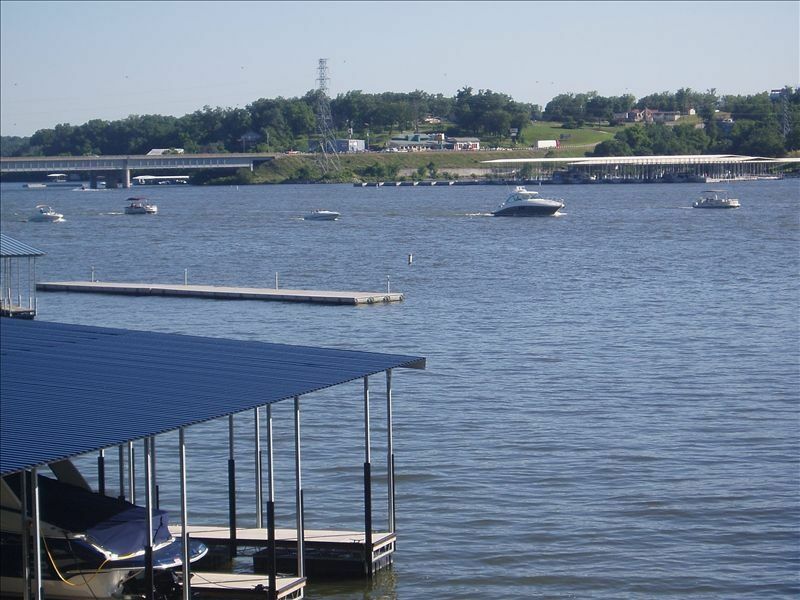 Very nice two bedroom two bathroom condo located in a great spot on lake of the Ozarks!! Condo was clean and modern. Had everything we needed for a great labor day weekend!! Amazing Location with a breathtaking view! We went for a girls weekend trip and are so glad we chose this place! It was very cute with a great view. There was enough room for 4 adults, and was nicely decorated. A lot of the places we thought about booking were tacky and over done, but this condo was bright, open, and tasteful. We absolutely loved the screened in porch - it was a great way to enjoy the view without all of the bugs that come with staying at the Lake. There are two pools, both a very short walk from the condo, and both have views of the Lake as well. The internet was on the fritz when we arrived, but the owner was quick getting back to us about it and we were able to fix it ourselves. The outlet mall is super close, only a few minutes' drive. We don't go to the Lake often, but will definitely consider this condo again if we decide to come back.